Firstly, before I give you the results from my first ever investigation into the paranormal world, I have to say a big well done to all that came along and contributed to this event to help raise money for a special young boy named Frankie Sherwood. My wife and I have met him on several occasions on the Children’s Cancer Ward here in Newcastle Upon Tyne as our little boy Finley had also been diagnosed with a childhood cancer. Over £800 was raised for Frankie because of this event. This was one of the reasons me and my wife jumped at the chance to do this, not only to raise money for Frankie’s cause, but it also gave us an opportunity we probably wouldn’t have thought about doing for a long time yet – if at all. Myself, my wife Donna and our two friends Dawn and Danny signed up and met up early at the eerie looking Ryton Masonic Hall claiming to be haunted. 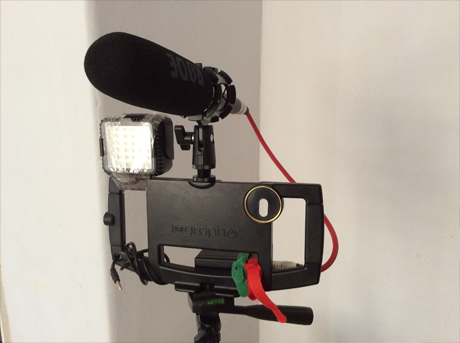 So, I put together a rig (shown above) built around my iPhone with the excellent (highly researched and recommended) Ghost Hunter M2 app, a Rode NTG2 Microphone into an IK Multimedia iRig Pre all fixed together with the excellent iographer carry frame for iPhone 6. The Rode NTG2 microphone being a broadcast microphone would obviously give me the highest focused audio recording I needed. Using the iRig Pre by IK Multimedia allowed me to hook straight into the iPhone without wasting the iPhone battery power throughout the night as it powered itself along with the microphone. But the best thing about the rig was the iographer case which made it easy for me to carry around the whole lot together and not have to worry about continually setting things up. It can even be used with a tripod if need be (which I will take next time). But what about this app, the M2? I looked into this thoroughly and it was designed by professional paranormal investigators. It includes many tools most investigators today use separately as the iPhone is so powerful it has the technology already built inside such as a barometer and all sorts. I tested the EMF tool which normally would give a reading of about 2.0 in a normal room, but when you move your iPhone near an electrical source such as another phone or ipad the meter shoots up to around 70 – 80. Keep this in mind when I tell you more further on in this post. 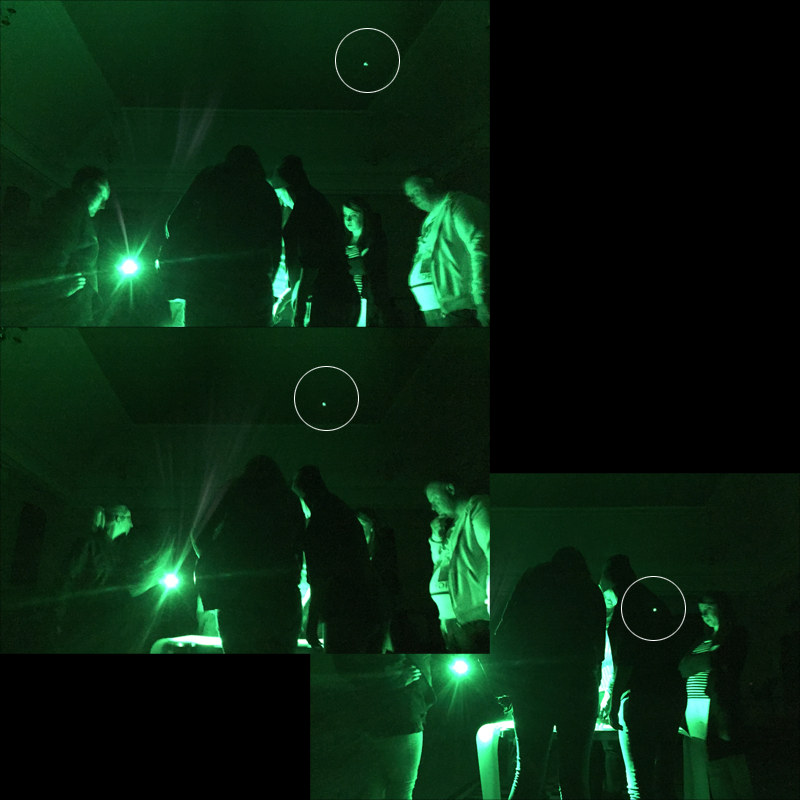 So if you want an app for your next investigation or ghost hunt the M2 app is the only one you need, tried and tested – get it here. Back to the investigation and my first Ghost Hunt. 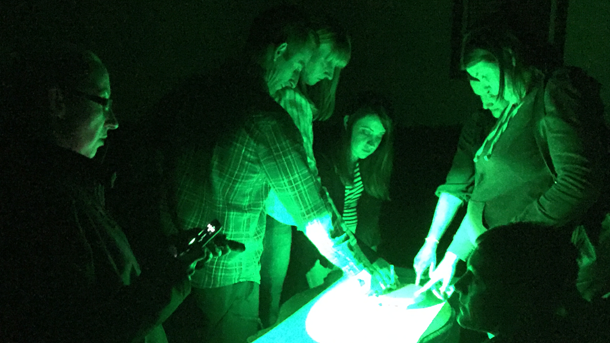 I was prepared technically but I wasn’t prepared for the activity on the night and how great the Pitch Black Investigation team were. They instantly made you feel at ease on arrival and even had spare torches available in case you forgot your own. We were lead into a few rooms throughout the night and suffered some very intriguing activities to say the least, especially in one particular room. Get in touch with Pitch Black Investigations if you want to do any investigations, or follow them on Facebook here. They treat it as your investigation but help you along. There are no tricks or silly dramatised actions but you still have lots of fun, scares, shrieks and laughter! So what were these activities I experienced and did they make me ‘believe’? The straight answer is yes, I am a believer as there is nothing else I can do but believe when I have exhausted all logical and theoretical avenues to debunk what I had experienced that night. Standing in a circle in the first room the atmosphere was intense. You could feel the pressure building up as we all stood holding hands for what seemed like eternity in the dark getting our eyes and senses accustomed to the room. That’s when things started to happen. Heat, cold, pressure, whispers, seeing things, feeling faint, someone throwing up, noises and that’s just the start. I swear I seen a small child about the age of my eldest 4 or 5 for a split millisecond – were my eyes playing tricks on me in the dark? Maybe. I kept quiet for a while as others mentioned feeling sick, wobbly, pressure and seeing other things, until another guy shouted out he saw a child. That’s when I confirmed it too. For the first time I thought I might not be crazy here. We split up into teams and off we went into other rooms. Our first room was the Ouija Board. This was the one thing we weren’t sure of but myself and my wife sat down to give it a go. I’ll be honest here and say I am glad it didn’t work, there was no activity apart from some tapping noises from a strange object behind us constantly and getting huge readings on the gear we brought. For instance, the M2 app I had was maxed out at 100 on the EMF reader, which was nowhere near any electrical devices, there certainly was some energy in this room – but the glass certainly didn’t move. When I say I’m glad the glass didn’t move I mean not because I was scared but because it added authenticity to an investigation and not some over the top drama on TV that could be faked. This, the EMF readings I was getting and the noises I confirmed myself, things were certainly adding to my belief radar or at least really making my analytical brain work overtime without any valid results to debunk them. Then we went back into the first hall we started in as another group were upstairs. We decided to try something called Table Tipping. Something I never heard of or seen to be honest but this is where my belief was confirmed. This was the activity I needed. I set my rig up across the hall to record audio from a distance. Something I still have to go through using a professional piece of audio restoration software called RX by iZotope. I will post any results I find later in another blog post complete with my shared recordings and any video footage i have with my rig. As it was recording I grabbed my iPad with the M2 app on it and placed it in the middle of the table we all stood around. WE all placed our fingertips lightly on the edge of the table in a circle. Taking a deep breath a few words were called out for a few minutes. That’s when I felt it. The table actually started to wobble gently, but not as though someone was shaking it, more like it was turning to jelly. The only way I can describe it is as if my fingers were magnets and I was moving them through liquid metal vibrating. Very weird!! I just went with it. Next thing I know the table lifts off the ground on one end just the slightest, you felt it. It did it again and again then higher tipping up. There was no way someone could tip that table with just your fingertips. Remember I was highly sceptical up to this point. My iPad slid down a bit but the EMF reading was maxed out again so I knew there was some energy around, a normal room only reads 2.0 but this was 100! Then the tapping started. Wow. That’s all I can say. Wow. You watch it on TV with Most Haunted and think to yourself “yeh whatever its TV”, but to hear and feel the tapping in the table through your own fingertips with nothing underneath and nobody’s fingers moving (I was watching like a hawk) that confirmed it to me. That was the moment I could not have any answer for to debunk it. Then the table tipped and spun round. There was one more finding of the night that added to my own belief from that moment on. Orbs. Now these are very debatable from what I gather doing my research online. On arrival we were greeted with CCTV screens which you can see below from the embedded Facebook Live feed. You will clearly see what you think are Orbs floating around – lots of them. You soon realise these are just dust particles floating around and the camera picks them up. However, the photos above show a different kind of ‘Orb’. A small orb of light I snapped a photo of with high exposure and slow shutter speed on my iPhone hanging above Dawn as she took part in an activity. She was getting a lot of activity happening to her all night. But this Orb seemed to stay above her and at one point moved down actually onto here or behind her then moved away. This wasn’t a dust particle because it was static for a while and then decided to move. Plus it glowed differently and was alone. I didn’t have any explanation for this at all. There was no other light source in that direction. Then there was massive table dragging noises which the other teams confirmed it was not them touching any tables. Something that happened to me personally on my way out of one room was when my iPhone wouldn’t stop taking automatic photographs. I only pressed the snap button once but it wouldn’t stop taking photos until I left the room. Hi there everybody, here every person is sharing these kinds of know-how, therefore it’s fastidious to read this web site, and I used to pay a quick visit this website daily. What's up, this weekend is good designed for me, for the reason that this point in time i am reading this enormous informative article here at my house. If some one wants expert view concerning blogging and site-building after that i suggest him/her to visit this blog, Keep up the good job. What a lovely story! The tale in this YouTube video that is posted here is in fact a pleasant one with having pleasant picture feature. Hi there everyone, it’s my first pay a visit at this website, and post is genuinely fruitful for me, keep up posting these types of articles. Hi i am kavin, its my first occasion to commenting anyplace, when i read this piece of writing i thought i could also create comment due to this brilliant post. Jb0S6E Very good blog post.Really looking forward to read more. Keep writing.